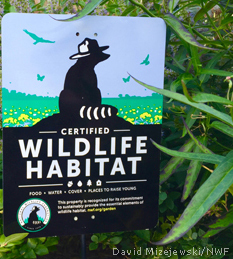 Certify your home, school, business or other site as a NWF Wildlife Habitat. Every wildlife habitat is an ongoing labor of love. We encourage you to register today, even if you are not sure if you are "done." We'll send inspiring tips to help! These documents are in Adobe PDF format. 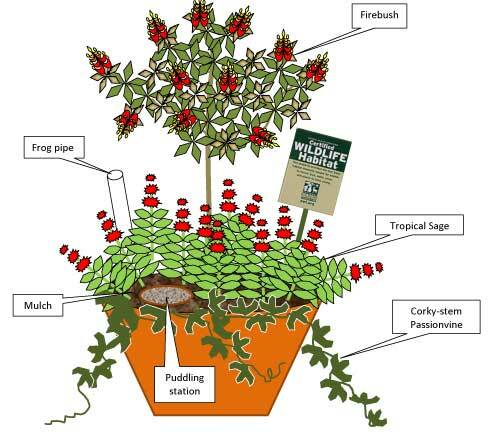 Habitat Steward, Alex Shore designed this simple habitat (download pdf with complete instructions) as a tool for encouraging those with limited space to establish and certify a habitat that would qualify for NWF certification. Often times people may think they don’t have the space required to establish a habitat or that doing so is complicated. This simple habitat can be planted either in a large container or installed in a small space in the landscape and would work for those residents living in a townhome or villa that only has a small patio or balcony space. This habitat can be created for less than $100 (including the $20 certification fee). There are many free pamphlets and flyers availble for you at the library and at Hagen Park next to the offices of Leisure Services. M.E. DePalma is the co-author of A Garden Diary: A Guide to Gardening in South Florida, a National Wildlife Steward and a member of the NatureScape Board.